This documentary titled, "Cancer is Curable Now" features renowned people who've been deeply involved in the treatment and research of Cancer and the shocking truths they have to share about our corrupt medical industry which has been feeding us with a whole lot of lies about what keeps us healthy, while suppressing natural cures which actually heal people from these so called 'incurable' diseases. A mind expanding documentary bringing a number of facts to light about the true causes of diseases such as cancer and how the doctors are trained to deal with them ... which quite ironically worsens the condition in most cases as it does little about removing the cause for cancer in the first place. Following which the body needs proper nutrition to be able to get rid of diseased cells ... like a raw food diet !!! 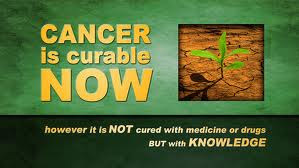 With 31 leading global cancer experts, scientists, doctors and authors, "Cancer is Curable NOW" is the most comprehensive and conclusive documentary about cancer and holistic cancer treatments ever made. Additional to a multitude of physical and dietary treatments this groundbreaking documentary uncovers the various problems, physical and emotional that promote and cause cancer. "Find the CAUSE, remove it, and your body will heal."